The sacred river, starting from Mansarovar Lake (Tibet) and ending with its various mouths near southern Sindh, was named as ‘Sindhu’ by the Aryans. The word ‘Sindhu’ implies ‘Sagar’ (Ocean) in Sanskrit. Some people attribute it to ‘Sind’, the son of Nuh and the brother of Hind, whose descendants ruled that country for many generations. Sindh has remained the cradle of finest and earliest civilization on earth, which even people inimical to her, cannot deny. Pandit Jawaharlal Nehru, in his book “Discovery of India” took pride in being the inheritor of Indus valley civilization. It is also said that, word ‘Sindhu’ stuck to its inhabitants, who were addressed as ‘Hindu’, because her Persian rulers could not pronounce ‘S’, and subsequently the word ‘Hindu’ became basis of ‘Hindustan’, which means ‘the land of Hindus’. The people of Sindh will remain same, whether they are termed as ‘Sindhis’ or otherwise. Noted poet, William Shakespeare has rightly said, “A rose by any other name would smell as sweet”. The term ‘Sindhu’ was used around 1500 B.C., when Aryans entered India through its north western entrances, but the people settled on the banks of river Sindhu remain same from 3000 B.C. uptil now and those people can fairly and justifiably be termed as our ancestors. It is believed that, Aryans wrote ‘Rig Veda’ on the banks of river Sindhu, though some of its songs are derived from ancient residents of the pre-Aryan period, which leads us to believe that, Aryans were not strangers to the land of Sindhu. Bhagwan Gidwani has also come out in ‘Return of the Aryans’, with the theory that Aryans originally hailed from Sindh and that some of them had gone out for want of different pursuits around 5000 B.C., and some of them came back to their homeland around 1500 B.C. The discovery of Mohan-jo-daro has unambiguously proved that our ancestors (the residents of Sindh, by whatever name they were called at the times) were highly developed people in various fields, as compared to their contemporaries. Very high proportion of burnt bricks used in their dwellings is one feature, which elevates the Indus people from those of the Uruk and subsequent early dynastic period in Mesopotamia. Another aspect of urban life, in which the Indus people were more advanced than any contemporary and many successive civilizations, was their town planning. Thus Mohan-jo-daro exhibits a rectangular pattern of main streets and minor lanes, the prototype of transatlantic cities. One of its unique features as compared to other ancient towns of the world was the well-developed public drainage system, installed not only in the great city, but also in places hardly big enough to be classified as towns. The object was efficient disposal of not only storm water, but household effluent too, as practically every house in Mohan-jo-daro had its individual bathroom, connected with the covered public drain in the street outside. 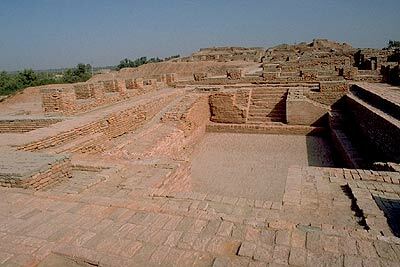 The religion of Mohan-jo-daro people was undoubtedly Hinduism. 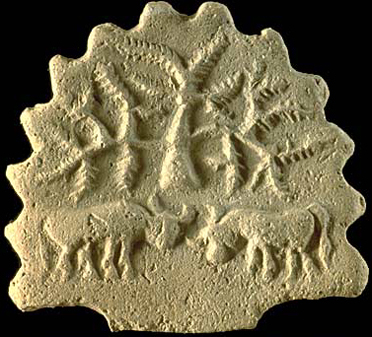 The seal amulets, which are such an important feature of the Indus culture, apparently show tree worship, including that of the pipal tree. Other objects of worship were sacred animals, composite animals, sometimes with human faces, which may indicate the coalescence of initially separate animal cults, and on the other hand their progress towards anthropomorphism. Three seals depict a deity, clearly identifiable as lord Shiva, in his aspect of Pashupati (Lord of Beasts) and in His two instances, the figure has three faces. 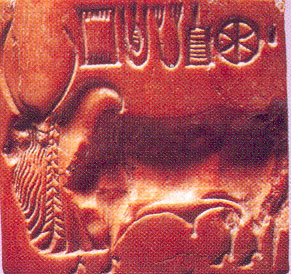 Here is a direct link with later Hinduism, and the prevalence of humped bull (Nandi), sculptured in the round or incised on the seals, reminds us of Shiva’s association with the animal and his personification of the reproductive powers of nature. Another such link is found in the wide spread veneration, among the people of Mohan-jo-daro, of the phallic symbols, identical with the common ‘linga’, virtually ubiquitous in India. The great open bath on the citadel mound, probably reserved for particular ceremony or for a privileged class, also point out towards importance attached to bathing, as is prevalent among Hindus, since time immemorial. Dwelling at length, Dr. Lambrick, in his book ‘History of Sindh’, deduces that the religious openness and tolerance was also prevalent, even in the days of Mohan-jo-daro, which only can prove the present day psyche and religious beliefs of Hindus and Muslims in modern Sindh. Dr. Lambrick continues with the assertion and says, “There seems to be something in the air of Sindh, which blurs the frontiers of ordinarily opposed creeds. In modern times, sufi mysticism was a bond between many Sindhi Muslims and Hindus, stranger still, while the Darya Panthis adored the river Indus, personified as ‘Uderolal’, the genius of the stream was revered by Muslims, under the name ‘Khwaja Khizr’; other shrines were likewise frequented in common and claimed, in friendly rivalry for a particular deity or a particular Pir”. As regards economy of the Mohan-jo-daro era is concerned, it is said to be primarily agricultural, in all probability already advanced beyond the stage of subsistence farming to production for barter against materials available in neighbouring territories. There was a variety of timber, gums, spices, salt, oils and dyes, over and above condiments and various food grains. Animal productions included ivory, shell and horn, vegetable fibers of several kinds were plentiful, and among them was cotton. The large number of spindle-whorls, discovered at Mohan-jo-Daro are of a type, which Dr. Mackay says, could only have been used for spinning cotton thread; and by a happy chance a fragment of the woven material survived, enwrapping a horde of jewellery. Moreover the appearance of the sculptured robes on busts and figurines suggests a thin light fabric. As against this, we have no knowledge of this use of cotton, or indeed of the occurrence of the plant, outside the Indus country for many centuries to come. Professor Gordon Childe has concluded from the results of excavations of Sumer, that Lapis-lazuli was commonly consumed by Sumerian people but imported from Oxus region, whereas it was already used in Indus, as well as Egypt. He further concluded that there was concrete evidence of a network of trade linking up the whole area from the Tigris to the Indus and the Oxus in 2500 B.C., and its extention west of Euphrates as far as the Nile. Another noteworthy period for Sindh could be 7th and 8th century, as described by celebrated Chinese traveller, Yuan Chwang; who had visited India in 641 A.D. He describes the people of Sindh, as rough and cruel in disposition, and inclined to settling their disputes by violence. In the same breath; he describes them as upright and honest. He further says, “The houses were of elegant architecture, which suggests the use of carved stone and were full of precious things”. He noticed that the language spoken in the area, differed considerably from that of central India. A Historian, Ali Kufi has been all praise for King Chach, as well as his son, King Dahar for their efficient rule and bravery. Though the reasons for the defeat of king Dahar (711 A.D.), at the hands of a Muslim General, Mohammad Bin Qasim can be argued. The boundaries of Sindh had shrunk during the reign of Rai Sahasi II, which king Chach was able to expand upto Makran in the west, Kashmir in the north, and Jitor in the east. Chach had been a successful administrator, before he became king; and the stability of his throne must have been due, largely to the measures he took for the protection and welfare of the people. Ali Kufi has described king Dahar’s bravery and physical courage in the face of danger, many a times. He had recalled, how in his young days, on foot and single handed, he killed a lion from which his followers had fled, and even in his last hours, he proved that the passage of 30 years had left his valour unabated. Noted lawyer, Ram Jethmalani has observed in the preface to K.R. Malkani’s book ‘The Sindh Story’: “For the Abusin, a classical name for Indus, is reproduced in Greece as the Coi-Indus (Corinthus), that is the people of the CoriIndus. These people are known to history as Phoenicians. The early historians always wondered, where these great fathers of western civilization came from. But no more. Now it is established that the Vedic Panis (who in India became Vaniks, Vanias and Banias) became in the west, Panikas, the Punic race or the Phoenicians”. K.R. Malkani has referred to Dr. Mumtaz Hussain Pathan in the same book ‘The Sindh Story’ and noted, “Many Sindhis (Hindu Sindhis) became trusted accountants in Arab business homes. Several Sindhi physicians became famous in West Asia, one of them Manik cured Khalifa Harun-ur-Rashid, when local and Greek physicians had given up hope. On another occasion, Manik revived the Khalifa’s dear cousin Ibrahim, after he had been declared dead by the physicians”. This is a brief introduction of Sindhis’ ancestor, who, while occupying a miniscule percentage of world population has left indelible mark on world communities in diverse fields, such as politics, economics and literature etc. In short a Sindhi is known as tolerant, compassionate, hospitable, peace loving, ambitious, hardworking, lover of fine arts and humanity.